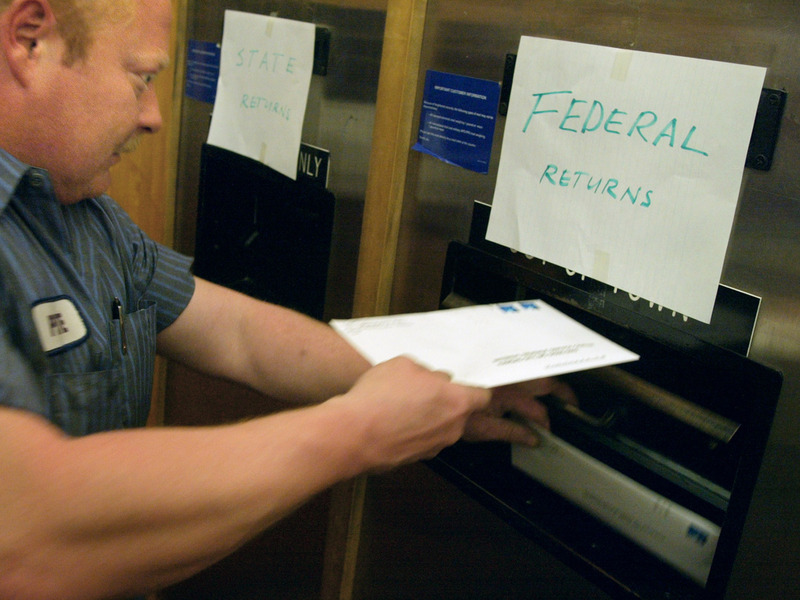 Think You Can Mail Your Taxes At Midnight? Think Again, Gramps : The Two-Way Back in the day — say, up until about a decade or so ago — the big news on April 15 was always about last-minute filers lining up at post offices as the clock ticked down. Now? It's a different story. Mailing your taxes in just before midnight: That's so 2002. One of the least imaginative, but always popular, stories for an editor to assign in years past was the annual Tax Day frenzy at the local post office. Younger Two-Way readers may not know this, but before e-filing was the thing to do, many procrastinators would wait until the last possible moment to finish their federal tax returns. And many post offices would keep staff on hand until midnight so that those returns could be postmarked before April 15 turned into April 16. "Local post offices used to take on a circus-like atmosphere on April 15 when many people would file their taxes up until a midnight deadline amid tax protestors and consultants on hand, often with some dressed up as Uncle Sam. "But those days are gone. "Since so many taxpayers now file electronically, most post offices no longer stay open late on tax day.
" 'We really stopped extending hours at our postal locations because there really isn't a need to any more,' said Elizabeth Najduch, a spokeswoman for the U.S. Postal Service's metropolitan Detroit region." "Way back when, it was one of the city's hottest nightspots. "There were lines out the door and frenzy within. Amid the excitement, deals were made and hearts were broken. "Now with over 80 percent of taxpayers filing electronically, most of the magic is gone." Even where post offices do seem to be trying to accommodate those who prefer paper and prefer to put things off until the last minute, things just aren't that wild anymore. "Thirteen post offices in the Denver metro area will be accepting returns until midnight for last minute tax filers," says TheDenverChannel.com. But 12 of those locations "will have self-service kiosks for customers needing stamps. Only one post office will be staffed until midnight." By the way, we have a question aimed at finding out just how well-prepared — taxwise — Two-Way readers really are. You have until midnight ET to respond. No extensions will be granted.